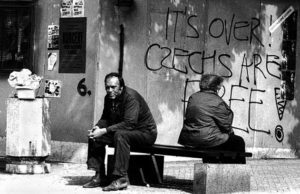 Join us on a journey back in time to 1990s Prague with its decaying facades, unexplored commercial opportunities, and the cultural scene that was just waking up after forty years of oppression. The neuroscientist and entrepreneur André Fenton, The Prague Post co-founder and literary agent Lisa Leshne, and the speechwriter and strategic communications adviser Rob Lewis will share their experience of living in Prague in the years that followed the Velvet Revolution. Moderated by Vera Dvorák. Followed by Q&A. and a light reception.